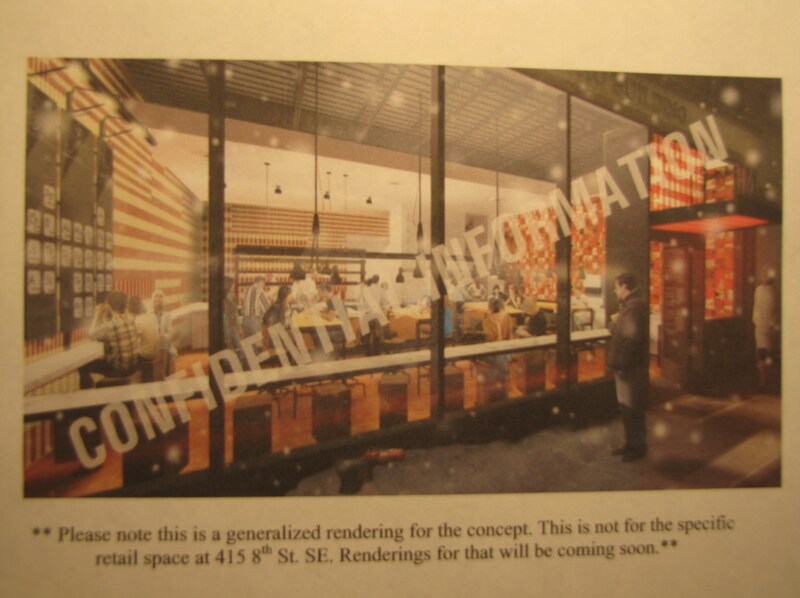 At the Restoration Society’s Tuesday night meeting, Zoning Committee Gary Perterson announced that his committee had approved IMA Pizza’s request for an exception that would allow opening a fast food establishment in the space at 415 8th Street, SE, formerly occupied by China Wall. Barracks Row zoning requires a special exception for fast food restaurants. IMA Pizza falls into the fast food category because you have to pay for the food in advance, even though inside seating for 40 will be provided. Customers will be presented with an array of choices – including gluten free options – and construct their own pizza. Under CHRS procedures, approval by the committee is tantamount to approval by the CHRS Board. Peterson said that Zoning regulations provide 15 or 16 requirements an applicant must meet in order to qualify for an exception, and he said the Committee was satisfied that the applicant had complied with the requirements. The application will still have to go through ANC6B, and according to Planning and Zoning Chair Francis Campbell, it will be on the committee’s agenda for the February meeting. Given the prior approval of the CHRS, it is likely that the committee and the full ANC will follow suit. That will send the application to the March 6 meeting of the Board of Zoning Adjustment. Isn’t CHRS a private entity? Aren’t a group of citizens? Why do have to pass anything for a business to open? Do they hold any power over zoning? Wow! Pizza! Never heard of it! Okay, not funny. But more substantively, Wow! Nice to have (perhaps) an alternative to the (very good) 7th Hill and to the (Media-spawned) WeThePizza. Can anyone think that that space on Barracks Row will not be better served by places like this? So Clint, how many pizza joints will be sufficient? Who needs another one? Even a “good” one. There are lots of us who think Barracks Row would be better served by something other than another fast food place. Hey, KC, I’m not a “community planner” or a restaurant entrepreneur–I’m just reacting to some news as a neighbor. If you’ve got some “world saving” ideas about how Barracks Row should be used, you should share it with us. Personally, I would like to live in a country that was not corporate controlled. Got any bright ideas on that little conundrum? My comment only was questioning whether we need more fast food joints–these are not restaurants, but take-outs. I would be interested to know what these requirements are. I hope one of them involves non-disposable plates, cups, flatware, etc (napkins ok). In my mind, anything with disposable plates, cups, flatware for eating within the establishment is a type of fast food that I won’t patronize, however accomodating they may be to those with gluten issues. Pete’s Apizi and 7th Hill are a great models (order, pay, get seated and food is brought to table). If this place follows Pete’s or 7th Hill’s model I have no issues with this exception.